Sheets and towels are added bookable in linen package. 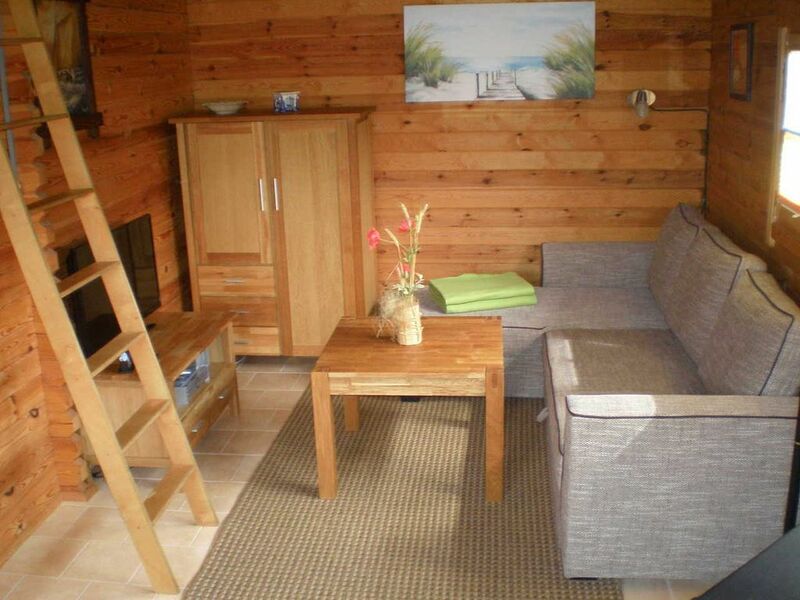 The log cabin is located in a very quiet location and on a very well-kept grounds. The log house has a living room with a sofa bed. Moreover, sleeps for three people in the sleeping loft available. For sleeping loft is accessed via a steep ladder. The ceiling height is 1.00 m. It is located in the log cabin, right next to the bath, a sauna, which can be used of course. After the sauna you can enjoy the evening entertainment at the stove. The romantic seating area on the terrace invites you to linger and can of course also be used for cozy barbecues. Bed linen and towels are in the linen package bookable. The tourist tax, which is due from 2018, is payable to the landlord. The amount is per person max. 1,50 € per day. Sehr freundliche Gastgeber, das Ferienhaus ist sauber und es fehlt an nichts. Auch der große Garten ist wunderbar, gerade wenn man mit Kindern oder Haustier anreist. Es ist ruhig gelegen, so das man sich wirklich erholen kann, aber man kommt auch überall schnell hin. Das Blockhaus ist optimal für einen Urlaub mit Kind und Hund. Das Haus überzeugt mit einem großen gepflegten eingezäunten Garten, eine ruhige Lage und einer urgemütlichen Innenausstattung. Die Vermieter waren sehr freundlich und zuvorkommend. Wir kommen wieder. realistische Bilder, sehr schönes Haus, nette Vermieter!